It appears that you have some sort of ad blocker extension in use? If that's the case, please disable it and refresh before shopping on this site. Ad blocking software may interfere with your ability to shop for items and checkout successfully. Use the navigation buttons above to search for tickets and inventory. Welcome to Balloon Fiesta 2019! All tickets are purchased for one session only. Balloon Fiesta consists of 14 "sessions". A session consists of all the activities that take place during a certain time frame (morning or evening). There is a morning session on each of the 9 days of the event, and there are 5 evening sessions throughout the event. The park opens at 4:30 am for morning sessions, and again at 3:00 pm for evening sessions. On double session days, the park is open until approximately 9:00 pm. On single session days (Monday, Tuesday, and Wednesday), the park is open until approximately 12:00 pm. For a full event schedule, Click Here. Balloon Fiesta is a weather permitting event. *No refunds, Please keep your tickets after entry as a rain check in case the individual session is cancelled by AIBF, Inc. due to weather. If you are experiencing technical problems with your purchase, please visit Festival Ticketing Purchase Support for more information. General Admission tickets are $10.00 per person, per session. One session is all morning activities or all evening activities. Good for entrance to Balloon Fiesta Park for one person 13 years and older. New for Park & Ride this year! There will be no “on site” Park & Ride tickets sold, all tickets must be purchased on-line or in advance at the Balloon Fiesta Gift Shop. The quantity of tickets at each remote lot will be limited. If you are unable to complete a purchase of tickets at a specific location for a specific time, it may be because that option has sold out. Please choose a different location or a different time. This year you have the choice of two different check-in times at the remote Park & Ride lots for your trip to Balloon Fiesta Park. The check in times will be: 4:00 am & 5:30 am for the morning sessions and 3:00 pm and 4:30 pm for the evening sessions. It takes time to load all the busses necessary to bring everyone to the Park so we hope the separate check-in times will reduce your waiting time. 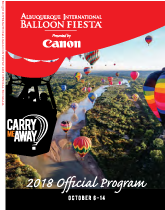 Balloon Fiesta will also provide a special Music Fiesta Park & Ride service from the Cottonwood Mall & Coronado Mall locations on Saturday October 12th at 12:00 noon. Prices are reduced until Midnight before morning sessions and noon before evening sessions so we can estimate the number of riders at each remote Park & Ride lot. Please follow the three easy steps to purchase your Park & Ride tickets. These steps include the day, sessions you would like to attend, location that you would like to park and the check in times for your departure. Lastly you will select the type of tickets and the quantity of each. Please note that the check in time is not necessarily the departure time. Chasers’ Club tickets are $45 per person, per session. The Chasers’ Club ticket gives you guaranteed seating in private outdoor patio located next to the launch field where you can enjoy traditional New Mexican food along with cookies and beverages. Coffee is provided and is served along with hot cocoa in the mornings and iced tea and lemonade are served during evening events. Cash bar is available. Children ages 6 and under are free. Gondola Club tickets for Adults are $110 per person, per session. Tickets for Children (ages 4-12) are $55 per person, per session. The Gondola Club is a private area away from the crowds, which includes a private seat, delicious food, courtesy shuttles, indoor restrooms just for our guests, and local entertainment all while looking out over a Mass Ascension, Special Shapes Rodeo, a balloon glow, competition or fireworks. Children ages 3 and under are free. Glamping tents are now available in an exclusive location in Balloon Fiesta Park. Enjoy spectacular views of the balloons flying high against a stunning background of the Sandia Mountains from the tent village. No need to battle the traffic, you'll be walking distance to the launch field. In this exclusive location you will have access to restroom and shower trailers, as well as a hospitality area with grills, games and lounge chairs. Skip registration! Login using your Facebook account. Please enter your email address in the box below and click 'Send' to receive a reset password link. Are you sure you wish to logout of your current account? Your password must be at least 8 characters and contain 1 number as well as 1 lower and UPPER case letter. Do you want to ship to ? Please enter the address you'd like your passes shipped to. No shipping method selected. Please select a shipping method. To use this method of payment please login. Click here to login. Please select your shipping method, agree to the terms & conditions below, and then click the PayPal button to checkout using your PayPal account. Once you do so, you will be relocated to Paypal.com and you will not be able to edit items or quantities in your cart. On Paypal.com, you will have 20 minutes to complete your order on the Paypal site. If you do not finish within that timeframe, your order will be cancelled. *The tickets will be sent to the email address of the PayPal account that is being used to pay for the item(s). To use other methods of payment please login. Click here to login. You must be logged in and have at least 1 item in your shopping cart before you can checkout. Please click on the panels above to add items to your cart and/or login. Credit Card gateway limitations prevent same day credits. Please either delete this order and create a new one or wait until tomorrow to process this credit. Ticket purchases on this site are powered by Elevate and protected by ProTechTix. There will be no "on site" Park & Ride tickets sold, all tickets must be purchased online or in advance at the Balloon Fiesta Gift Shop. The quantity of tickets at each remote lot will be limited. If you are unable to complete a purchase of tickets at a specific location for a specific time, it may be because that option has sold out. Please choose a different location or a different time.